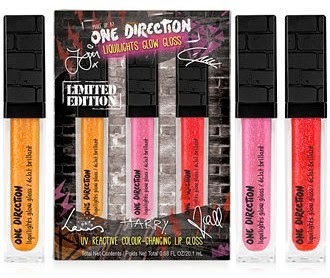 One Direction came out with a makeup line last summer and I have to say, these British boys have a knack for creating fun limited edition cosmetics sets. Three new sets (which can be purchased from Macy's for $16.50 each) were recently released. Highly-pigmented mascaras, lip glosses and nail polishes are perfect for adding a pop of color to your look. With three great sets to choose from, it's easy to find a gift that every One Direction fan will love. Create your own UV-reactive nail art with this kit of polishes and glitters. The glitter is a little messy but it's worth it for a sparkly mani. Nothing shakes up your makeup routine like a pop of color on your lashes. The set comes with three mascaras: yellow, blue and pink. and I haven't tried this yet, but apparently you can use the mascaras on your hair too! These glosses are super-sparkly with a hint of vitamin E to keep your lips hydrated. The glosses glow different colors under UV black light. Remember to like Makeup by 1D on Facebook!